The canna lily (Canna x generalis) grows in subtropical and tropical areas and is perfectly suited to home cultivation throughout Florida. Canna's relation to the banana tree is easy to tell by its large leaves, though canna leaves feature streaks of purple and orange. 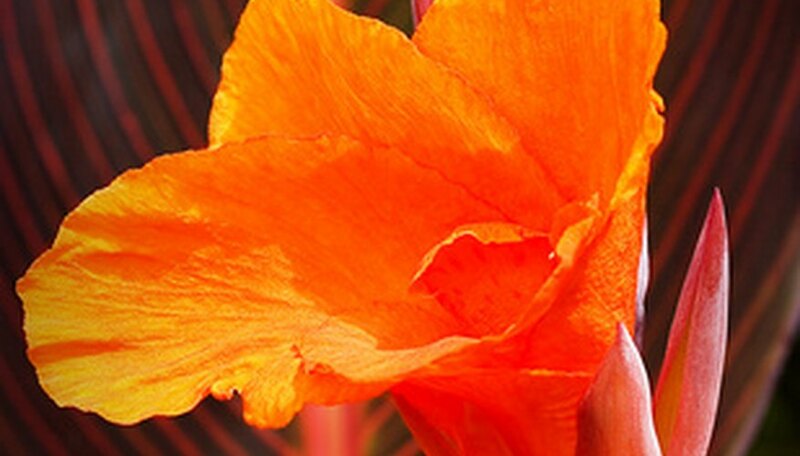 Canna flowers come in bright hues of red, yellow and orange. Depending on the variety planted, canna lilies reach 2 1/2 feet to 10 feet in height and dwarf canna average 1 1/2 to 6 feet. Canna are planted from rhizomes, a type of tuber. Wait until frost danger has passed in northern Florida to plant your canna, typically in late winter or early spring. Southern Florida gardeners won't have to worry about frost. Choose a site that offers full sun. Cannas can also grow in part shade but do best in full sun. Turn your native soil over with a shovel if you plan to plant canna in the ground. Flip the soil over with a shovel to aerate it and break apart any lumps. Remove any weeds, rocks, sticks or debris from the soil. Amend the soil for planting. Canna lilies prefer well-draining and rich soil. Florida gardeners can amend their often-sandy native soil by adding 1 to 2 inches of compost or manure over their natural soil, then turning the compost or manure over with the soil. Dig 3- to 4-inch deep holes for the canna. Space dwarf cultivars 1 foot apart in the bed and full-sized cultivars 1 1/2 feet apart in the bed. Sow the canna rhizomes in the prepared holes, then cover the rhizomes with soil. Water the newly planted canna until the soil becomes saturated. Continue to water the canna whenever the soil dries out; the rhizomes will germinate and grow flowers. Northern Florida gardeners can dig up the canna rhizomes in fall to protect them from frost and re-plant them in spring, while southern Florida gardeners need not do so.